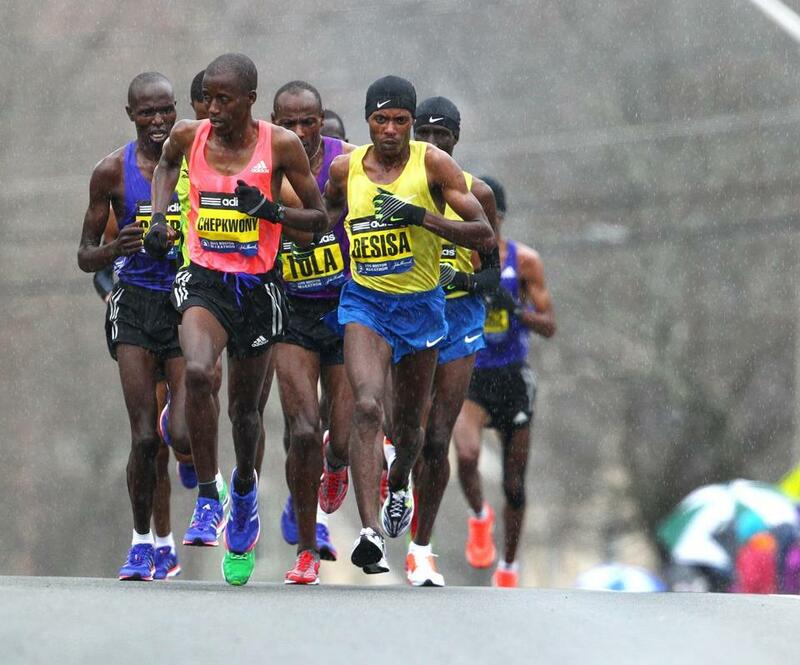 It’s a fair question: why spend millions in prize money and appearance fees to bring a few dozen very fast, mostly African, runners to the Boston Marathon each year? Why cater to a tiny phalanx of elite athletes who compete for cash based on their ability to cover the marathon distance in times so impossibly beyond the average person that they seem to be participating in a different sport? Why lavish scarce dollars on professional runners when the soul of the marathon is to be found among the masses and in the inspiring stories of those who overcome towering odds to complete the race? Mr. Polit’s letter to the Globe came a day after that paper reported on the extraordinary story of Maickel Melamed, who finished the marathon early Tuesday morning after having been on the course for more than twenty hours. Another letter-writer suggested that Melamed’s reply (when asked why he kept running through that long, cold, day and night) be immortalized on a plaque to be placed at the Marathon Finish line. “For you. I run for you.” Isn’t that the spirit we should be celebrating, not the crass professionalism at the front of the pack? Like Mr. Polit, I was there and observed the Boston Marathon just before and after the race began offering prize money. I remember how in 1983 Greg Meyer ran 2:09 and Joan Benoit ran 2:22:43 to smash the previous world’s best. I was in the field when Geoff Smith and Lorraine Moller won in 1984 on a rainy day not unlike last Monday. And I remember 1985 when Smith won again on a hot, humid day, running 2:14, four minutes ahead of second place. That 1985 race revealed that changes had arrived in the world of road racing. There were other big marathons on the calendar and they were offering sizable prize purses to attract the best runners in the world. Boston was well on its way to becoming a local race, no longer a showcase for global talent. Maybe the masses didn’t realize it yet, maybe the spectators didn’t notice anything different, but the Boston Marathon was losing its road cred. The sponsorship of John Hancock allowed the Boston Marathon to remain among the world’s most prestigious marathons. Why does that matter? In the complicated ecosystem of a major road race, there are many overlapping interests and populations. There are Olympic athletes who stand to earn hundreds of thousands of dollars for a victory plus appearance fees (not to mention enhanced earning power for future races). There are the near-elite American runners seeking to break through to the next level, whether that’s defined as qualifying for the Olympic Trials or simply improving their relative position among the hundred or so best runners in the country. There are the talented amateurs, including age-group runners, who hold down full-time jobs and train in obscurity for the love of the race and perhaps the once-a-year chance to be hometown heroes among their friends, families, co-workers, and training partners. There are the dedicated, but middle-of-the-pack runners for whom qualifying for Boston is a lifetime dream. There are the veteran runners who were spry once, but now run out of habit or because they have become famous for their Boston streaks. There are the charity runners, who draw their inspiration and purpose from a cause more important to them than personal achievement. There are the wheelchair athletes, the amputees, the visually impaired, and the cadres of military personnel who march from Hopkinton to Boston. Together they form an unforgettable parade of human experience. The elite don’t detract from this parade, they lead it — both literally and figuratively. The elite may run for prizes, but their battles with the course and with each other bring in massive media attention, including sponsorship and television money. That money helps pay the ever-rising bills for a marathon that has grown from a few hundred in the 1960s to a few thousand in the 1980s to over thirty thousand today. That money helps pay for the expansion of security, for better crowd control, and for the expansion of runner amenities that helps keep Boston a destination marathon for runners around the country and the world. Spectators along the course might be there to support a friend or family member, and might not even make it to the course until after the elite have passed by, but those watching on TV and on the Web want to see a competition. The race doesn’t negate the non-competitive, run-to-finish ethos of citizen runners, it complements it. Each participant runs to win, it’s just that each has his or her own definition of winning. Imagine if there were no elite. There would be winners, but it would be inevitable that their performances would be judged inferior to the times from Rotterdam, London, and other spring marathons. Local interest might remain strong, but national and international interest would wane. Sponsorship money would dwindle. The quirky, inconvenient aspects of Boston would become more apparent — the fact that it is held on a Monday, that it is a point-to-point course, that it occurs during a time of year notorious for its fickle weather. No elite runners would mean fewer citizen runners. Would we feel the same about the race if it returned to 1980s numbers? Our letter-writer imagines a nostalgic amateur past, but that was when world-class runners had few options and Boston could attract world-class runners based on prestige alone. Would Boston have prestige today stripped of its World Marathon Major status? There’s nothing wrong with amateur athletics, but in professional running is not the enemy of amateur running, it is one of the elements that has enabled the growth of races and the surge in popularity of marathons, in particular. There’s a reason running Boston is on so many people’s bucket list. It’s a chance to be part of the whole parade, encompassing those who (still) receive a laurel wreath as well as cash and a car, and those who finish after midnight when everyone else has gone home. This entry was posted in Marathon, Pro Runners, Uncategorized and tagged Boston Marathon. Bookmark the permalink.